Some fans of Doris have followed her musical career since its beginning. In so doing, their collections often include every single that was ever released. So many of these were never added to album collections and are considered lost today. If they were only released as singles, they only exist on those records originally purchased by diligent fans. Often, the hit side of a record became popular and the flip side was neglected. The hit side was reproduced on an album collection, and once again a song (the flip side) was lost or relegated to obscurity. (The same can be said of the number of songs Doris sang and/or recorded while she was female vocalist with Les Brown and Barney Rapp. For our purposes here, we are not referring back to those at this time.) However, research has shown that one of Doris' up sides with the Brown aggregation is very very hard to find and worth a listen. So, it follows next. It is called "The Deevil, Devil, Divel". Back to 1947 and 1948. Of course, we hope you have heard "It's Magic", "Love Somebody" and the other hits from back then. But there are reclusive others. The next audio file (below) contains four radio songs . "My Sugar is So Refined" and "South America, Take It Away" are the kind of novelty songs that Doris does best. "I Don't Know Enough About You" (a hit by Peggy Lee) and "More Than You Know" could have been hit singles, had they been recorded and released. Doris' very first single record release (that had brief sales chart and radio play activity) was called "It Takes Time". It appears in few collections today. However, her first session produced four sides...the other three are readily available on compilations: "Pete", "Tulip or Turnip" and "My Young and Foolish Heart". So we do not include them here. 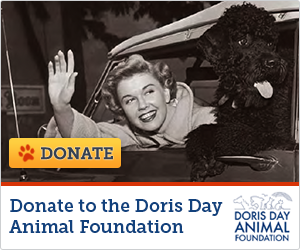 "A Chocolate Sundae on a Saturday Night"
"I've Only Myself To Blame"
"I'm Beginning To Miss You"
After the movie was released, Doris was "discovered" not only in the U.S. but all over the world. Columbia Records knew they had a "prize property". They had Doris in the recording studio as often as they could get her, and she recorded all kinds of songs for release or for posterity. In this case, we are looking at the ones that are not well known, were minor hits and the ones waiting to still be discovered. "I've Forgotten You" (1950) flip side of Dream. "Love Ya, Honey" (1950) with Jack Smith from "Moonlight Bay"
"Orange-Colored Sky" (1950) a hit for Nat King Cole. "A Load of Hay" (1950) flip side of Orange, it was Doris' first single on the new 45 r.p.m. format at the time. "Got Him Off My Hands" (1950) hear flip side, "Kiss Me Goodbye, Love" in audio file below this section. Both Single Selling Records and Album winners combined to make these three years, musically, the most prolific in Doris Day's career as a recording artist. After coming off of a year in 1950 with several hit albums, 1951 produced two #1 albums and a number two and two top ten albums in 1953. At the same time, Doris was often found in the recording studio adding more songs to her repertoire. Below are some of those which are rarely heard today. Doris with a trumpet. It helped to turn the soundtrack from "Young Man With A Horn" a #1 Album Seller in 1951, and two hit singles with Harry James in the same year ("Would I Love You, Love You, Love You" and "Lullaby of Broadway"). Unfortunately, this one with George Siravo and his orchestra only got minor air play. It deserved so much more! Flip side of top ten hit, "Shanghai"
Flip side of top ten hit, "Mr. Tap Toe"
Below some audio files of other songs from this time period that deserved a better chance at making it , deserved to be heard or in some cases, at least recorded.